There’s always something to celebrate in Wrigleyville. It’s home to Wrigley Field, where people of all ages and backgrounds come together to support the Chicago Cubs, but it’s also the site of bustling, low-key entertainment and night life. While things get pretty active near the stadium, where there are plenty of bars, restaurants, and souvenir stores, the residential side streets are broad, shady, and lined with historic homes. There’s also more to explore in nearby Boystown and West Lakeview. As your Wrigleyville movers, we’ll help you settle in your new place so you can go join the celebration right away. Nearly 8,000 people live in the Wrigleyville area, with a few more men than women. Most residents are in their 20s or 30s, and tend to make around $70k or $80k per year. Over half have Bachelor’s degrees, and a quarter also have their Master’s. Like its surrounding Lakeview neighborhoods, Wrigleyville was settled by European immigrants in the mid-19th century, and became part of Chicago in 1889. The original Wrigley Field was built decades later, in 1914, when the area was a thriving working class community. 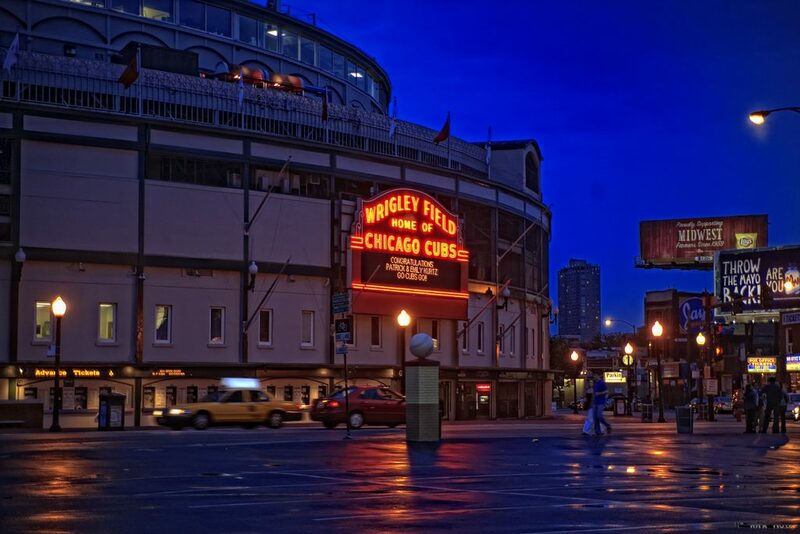 The Cubs began playing there a few years later, and the neighborhood continued to grow and develop through the next century. Now you’ve got the gist, here are some highlights—and basics—we found to help you start your best Wrigleyville life. Gill Park: Indoor and outdoor recreation facilities. Wrigley Field: Where to watch the Cubs. Sluggers: Bar with kid-friendly arcade and batting cages upstairs. Mercury Theater Company: Live shows for the whole family. Metro Club: Indie concert venue. Public House Theater: Comedy and sketch shows. Pizza: Dimo’s Pizza. Value-driven joint that delivers. Open late. Burgers: Rockit Burger Bar. Great place for game-watches. Hotdogs: Byron’s Hotdogs. Serves burgers, too. Counter service and delivery. Thai: Cozy Noodles ‘n Rice. Playfully decorated space, also delivers. Brunch: Uncommon Ground. Farm to table. Live music at night. Steak: Tango Sur. Prime meat and full Latin American menu. Global: PR Italian Bistro. Italian inspired, international cuisine. Game Watches: A couple across from Wrigley Field. Vines on Clark. Daily food deals. Game Play: Toons Bar & Grill. Friendly dive with pool and shuffleboard for all. Performance: Wrigleyville North. Live music and open mic nights. Local: Guthrie’s Tavern. Lots of beer choices and board games. History: Gingerman Tavern. AKA “Gman.” Neighborhood fixture, cash only. Dancing: Smart Bar. Open late. Same building as The Metro. Mariano’s: Full grocery, prepared food. Jewel-Osco: Two close by. Broadway store open 24/7. Emerald City: A place to gather with community. Julius Meinl: Viennese pastries and food. Asado Coffee: Roastery that serves drinks. Belmont Harbor Dog Beach: Lots of space to splash. Inside Lincoln Park. Wiggly Field: Inside Noethling Playlot Park. FFC East Lakeview: Includes spa, pool and childcare. Southport Fitness: Individual and group fitness facility. Orangetheory Fitness. Equipment and classes. This has been a tiny sampling of the great things you’ll experience at your new Wrigleyville home. As a seasoned Wrigleyville moving company, we’ve learned all about the staples and cool places in the area. We’re happy to share more! As you’re planning your big move, cross one major thing off your to-do list, and book Wrigleyville movers who’ll a take load of stress off your mind. Call us at New City Moving, and we’ll help you move safely, smoothly, and on-schedule, so you can settle right in and start living your greatest Wrigleyville life.